Building homes for the homeless and a healthcare training center. I wrote these words in reflecting on a walk in a village in Northern Haiti with a physician who had been coming to Haiti for twenty-five years. Since her first visit as a medical student, little had changed. Dictators and governments had come and gone. She had watched one program after another fail to improve the lives of ordinary Haitians substantially . Is there an answer to the shame? How can the next twenty five years be different than the previous twenty five? What must we do? · We have to assert the radical power of love. From the wells of love, spill the good will, the generosity and the solidarity which must be shared with our Haitian brothers and sisters. Love resists the temptation to despair and asks us to imagine again a better life for all God’s people. · We must work with the family. It is here in the foundational relationships between husband and wife and parents and children that we can have the greatest impact. To build, support and renew the family, we have a Maternal Life Haiti affiliate which conducts Faithful House workshops throughout the Archdiocese of Cap Haitien. Nearly 1000 couples have been touched by this work. · We must create a “climate of security.” The vast majority of Haitians have little security: they have few employment opportunities; they have limited food resources; their lives can be upended in an instant by violence or natural disasters. Thousands and thousands of Haitian families live in grossly sub-standard housing which makes them vulnerable to earthquakes, hurricanes, storms, disease transmission and family discord. In 2010, an earthquake struck Haiti leading to 160,000 deaths, many which could have been prevented by a better housing infrastructure. We have set in motion the first two words. Our training teams led by Mr. Jacquieus Joseph and Mr. and Mrs. Martial Verdieu are immersed in helping families in communities and parishes. They see the suffering, the challenges and the possibilities. From their work and from the inspiration of a brilliant professor of music in Montana, the third word, “security” is ready to take flight. The security of a family in a safe home is the necessary and missing foundation for human development in Haiti. Gary Funk is a DMA professor of music recently retired from The University of Montana. In the aftermath of the 2010 Haitian earthquake, he was driving through a forested part of Montana and listening to the radio describing the death and devastation wrought by the earthquake. He looked out his window to see vast stretches of beetle-killed pine trees. 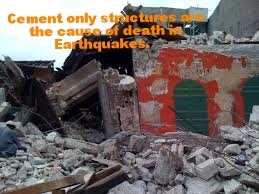 He knew that in Haiti thousands died because houses and buildings were constructed out of poorly made cement. He knew that Haiti was 99% deforested. While many were struggling with the question of “Why?” Gary was asking a different question, “Why not?” Why not take the millions of acres of beetle-killed wood and other salvage wood from Montana and western forests and bring the lumber to Haiti for construction of earthquake/hurricane resistant, wood-framed structures. He founded an organization, “Wood for Haiti,” consisting of engineers, forestry specialists, master carpenters and architects who have had years of experience in their respective professions and in construction projects. 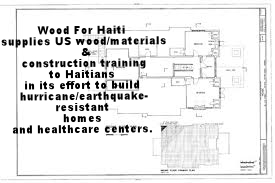 Together, they have planned every phase of project development: harvesting the wood, transporting wood, tools and equipment to Haiti, designing architecturally and structurally to withstand natural disasters,, training Haitian carpenters and developing criteria for home ownership. Working with Wood for Haiti and the Archdiocese of Cap Haitien, the first model house is ready to be shipped to Haiti. It was constructed as a prototype small family house in Missoula, Montana, and is being stored at a warehouse in Butte. In Haiti, the mayor of the town of Milot has deeded the land. We now need the funding to ship the house to the Cap Haitien port, assemble it, add the plumbing, a septic system and several external fixtures. We are confident that what will be realized in Milot is just the beginning. We have an opportunity to export a critical resource: wood for Haiti, wood that marks the words, love, family and security. Churches and humanitarian organizations will be able to sponsor construction, training and program implementation. Building and trade skills can be taught and shared, creating jobs and economic opportunities. The Central Government of Haiti will observe that the provision of safe and secure housing must become and can become a national priority. Victor Hugo wrote, “There is nothing more powerful than an idea whose time has come.” What has been imagined in love can be constructed in wood. Together we can create those sacred spaces that humanize us: the sacred space of love, respect and kindness between a man and woman, the sacred space of a house which gives shelter, security and comfort to a child, the sacred space within a soul which clings to hope when hope had seemingly been lost. Program designed to strengthen marriages and save lives. Taught to strengthen marriages and save lives. Brining hope to the families of Haiti.